We often see things very clearly. 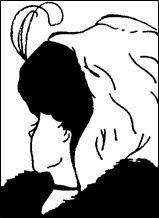 We can look at the famous illusion and we know, we insist – we can argue clearly – that we see a young woman. The truth is that we don’t always see the whole picture. We think our vision is clear. We can unmistakably spot the flaws in other people. We can see that their behavior is sinful, their parenting styles awful or their faith life is tepid. We know that these people are not having to work as hard as we did to get some of the same benefits. But we don’t always see the other side of the picture. We might not focus on the struggles in other people’s lives. We don’t appreciate the suffering that so many live with and the family situations that are agonizing for them. It can be too easy for us to simply dismiss people by what we see – and move on with a feeling of satisfaction, grateful that our lives are better than theirs. To really see the whole picture for what it is, we have to remember the words of Jesus: We have to remove the huge plank of wood from our own eyes before we can point out the splinter in someone else’s eye. There is an inconsistency in each of our hearts, being blind to the fact that we are unreliable sinners while at the same time we are critical of someone else for being an unreliable sinner. So why do we spend so much time judging those around us? Why do we aim so much energy, anger, frustration and impatience at others? It can be a good exercise in life to take a look at what is underneath our own behavior when we are critical of others. Where to begin? With a simple prayer. Loving Brother Jesus, I ask you to come into my heart for the next few minutes and open my eyes to the splinters and beams of wood in them. Help me to have compassion for others and for myself. Compassion for others and myself? Too often our own criticisms of others come out of our own feelings of inadequacy. If we can enter deeply into Jesus’ endless love for us, we might begin to encounter our own doubtful hearts, not really believing how much we are loved. Not feeling how profoundly forgiven, graced and loved we are by the God of us all. And without having that kind of love touch our hearts, we don’t feel the incredible sense of gratitude that moves our hearts to love others. St. Ignatius Loyola’s insight from his own relationship with God was, that grateful hearts are generous hearts. Jesus wants us to feel his limitless love for us, and he wants us to love one another. But our human condition doesn’t always make this easy. When we feel insecure, when we feel others have more than we do, when we see those whose lives seem to cut corners to get what they want, we get angry or resentful. What Jesus really wants for us is peace in our hearts. We don’t have to manage the world and everyone in it and we don’t have to judge them. Jesus will be with us today, tomorrow. “I will be with you. Always.” Those words weren’t just uttered to the disciples as Jesus ascended into heaven. They are given to each of us - each day of our lives. And that can make us eternally grateful, more aware of what it means to be flawed and yet loved, and more compassionate with those around us.